Are you certain you’re taking advantage of every aspect of your marketing to get the maximum results possible given your limited resources? 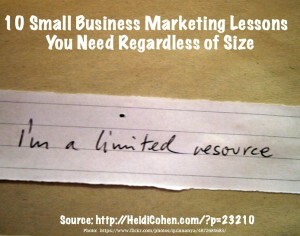 Don’t think that this doesn’t apply to your business because it’s larger and has greater resources. The reality is that the more resources you have the more complex your marketing is and the more likely it is that you’re not getting the biggest bang for your marketing buck. Small businesses by their nature must ensure that every aspect of their company supports their revenue generation and growth. 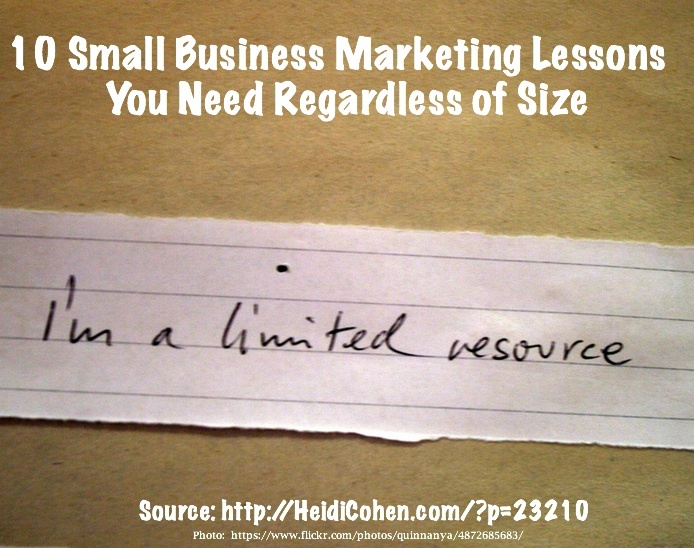 Here are the 10 small business marketing lessons I learned. 1. Take the time to get to know your customers. Many owners jump into their business without examining and understanding their target audience. Actionable Small Business Marketing Lesson: Create a marketing persona to get insights into your buyers and their purchase needs. This will save you time and money since you’ll know what your potential buyers are looking for. 2. Distinguish your offering from your competition. Assess what your competitors (and close substitutes) are doing from your customers’ perspective. Then map out where there’s a gap in the offering you can fill. For example, in a sea of sheep wool offerings, Bijou Basin offered yak yarn and blends. It stood out from many different types of sheep yarn. By contrast, Tess Yarns provides color, color and more color. Unlike any other yarn vendor, Tess Yarns organizes their offering not by yarn size or type, but by color. To this end, create your small business brand to distinguish your firm. You must get the word out about your business whether it’s via word of mouth or advertising. Marketing is necessary. A leather craftsman named Lanny had a booth where he sold his handmade wares such as high quality belts that he sized to order while you waited. Unfortunately, he had no signage to attract shoppers or helper to handle the sales. Actionable Small Business Marketing Lesson: Publicize your firm using the best methods you can afford to effectively reach your customers. Maximize every business element and interaction by incorporating your message in contextually relevant ways. 4. Choose your location with care. Think beyond the rental cost since location, location, location matters! Sales depend on being where your audience is. On digital and social media engage and provide content where your target audience spends their time. Also, choose your URL or digital address with care for memorability and ease of spelling. At one point, I worked for a well-known clothing brand whose management chose its retail locations based on the cheapest price. Lower rental prices translated to lower sales. Actionable Small Business Marketing Lesson: Choose to establish your business where people normally spend their time, both in the physical and the online worlds. 5. Appreciate that product presentation matters. Show your product in a setting that makes people want to own it. This is why you need to provide the 5 basic content types including styling. An auctioneer sold wooden thread bobbins with remnants of thread and yarn on them for $0.50 each. These spools were thrown into a box on an out of sight lower shelf. While I wondered if the yarn was knitable, two women wondered how many they could get into their suitcases. When I ask what they intended to use them for, they responded that planned to sell them for $15 a piece as a home décor item. Some markup! Actionable Small Business Marketing Lesson: Invest time and resources in presenting your product to attract the optimal price. You must balance the cost of your time and resources to improve your product presentation with the net increase in price. Don’t spend more than you’ll recoup in profits. 6. Use packaging to distinguish your offering. Astute yarn vendors like Miss Babs monitor which patterns are popular with knitters on Ravelry, a knitting, crocheting, and spinning social media community. Based on these trends, Miss Babs creates coordinated multi-color packages of pre-measured yarn that sell at a premium for the amount of yardage. Buyers are willing to pay a bit extra rather than buying larger amounts of each color. Actionable Small Business Marketing Lesson: Take advantage of current trends to create more tailored offerings for which your audience will pay more. This has broad applicability for small businesses seeking to exploit opportunities such as larger quantities and home delivery. Not sure what your audience wants? Ask them. 7. Underestimate customers’ desire for quality at your peril. All else being equal customers seek superior products. In fact, many customers will pay extra to get better products. With products that include an element of craftsmanship like specially produced or dyed yarn, customers choose to pay more and perceive the investment to be worth it. As a result, you make higher margins. For example, no knitter wants to invest time in making an item only to have the color bleed onto their hands and clothes. Actionable Small Business Marketing Lesson: Provide customers with the best quality product you can afford to keep them coming back for more. At the Sheep and Wool Festival, knitters rush to shop at the top quality vendors and wait in long lines to purchase. 8. Low price always attracts buyers. There were several examples of vendors offering bargain basement prices for odd lots of mass produced yarn. They continually attracted lines of buyers. Actionable Small Business Marketing Lesson: Leverage opportunities to provide more custom, quality products where you can charge a higher price. Have a sales bin or rack where you offer older or last season’s product at a greatly discounted price. It’s a great way to move excess inventory for your cost. There’s truth to the adage: people buy from people. I bought a hank of fine white lace wool from Wales to make a wedding shawl because Polly, the owner, and I spent time talking about her country. She then showed me the difference in the various weights of yarn and how it knit up into shawls. I was sold. Actionable Small Business Marketing Lesson: Invest your time in interacting and engaging with your prospects and customers. It will come back to you in repeat business and word of mouth reviews. 10. Don’t do everything yourself. Most business owners and executives need help, especially in today’s world of vanishing support staff. Consider the value of your time and lost business if you do everything yourself. You’ll be like the leather craftsman mentioned above. Actionable Small Business Marketing Lesson: Determine what tasks you can give to someone else. If you don’t have the resources to invest in hiring people, get creative about how you pay and use your time. Determine if there’s some way you can exchange services or use your time to create more sales. Still need help, try your family and friends. The bottom line: Check every element of your marketing to ensure that it’s pulling its weight in terms of yielding the highest return possible. Use these 10 small business marketing tips as a checklist. Pricing is not about the numbers. Tags Derek Halpern, Peter Shankman, Ravelry, Small Business Marketing Lesson. Bookmark the permalink. simple and sober understanding 10 steps how business increase. Such a nice information thanks for the sharing ..